Manchester United sent out a tweet this morning with a quote from their former player and captain Nemanja Vidic. The Red Devils tweeted a picture of Vidic during his United days with a quote about the privilege of playing for the club, and the timing of it is interesting, to say the least. This message comes just after Pogba told Sky Germany this week that he couldn’t guarantee he’d stay at United, even in the coming months. The France international is one of the best players in the world on his day, but he certainly hasn’t had his day too often during his time in England so far. 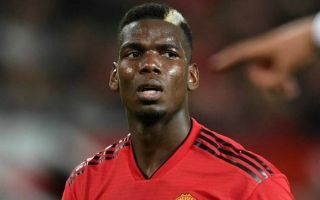 But the very least fans can expect from Pogba is commitment to the club and an acknowledgement that they do remain one of the biggest institutions in world football. Tell @paulpogba that. Even Mbappe is Matured compared to Pogba and Mbappe is 20 yes old and pogba is 25 yrs old. A difference of 5 yrs. Pogba needs to play for the badge if he can't he needs to leave. Tell that to Pogba. In fact he should get the hell out of our club. The sooner the better.